Below you can view all the homes for sale in the Van Story Hills subdivision located in Garner North Carolina. Listings in Van Story Hills are updated daily from data we receive from the Raleigh multiple listing service. To learn more about any of these homes or to receive custom notifications when a new property is listed for sale in Van Story Hills, give us a call at 919-759-5754. Just Off of Timber Dining Room in Van Story Hills/ 3 Bedroom 2 bath Brick Ranch w/Screened Porch and Grilling Deck/ Updated Kitchen Cntrtops/ Updated Bathrooms with Nice Shower in Master Bedroom/ Newer HVAC/Living Room and Dining Rooms Have Divided by a Wall But Can Be Opened Back up For Your Family Needs...These Owners Just Wanted Two Separate Offices/ Nice Woodwork Trim in Home/Tons of Privacy and Plenty of Blooming Landscape to Enjoy..Rose of Sharon, Gardenia, Azaleas, etc MLS#2241172. 988. 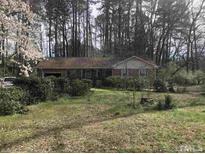 Great value for a renovated home in a great location. MLS#2238038. 1319.